Kenosha County Executive Jim Kreuser (left) and District Attorney Michael Graveley address reporters during a Monday news conference. 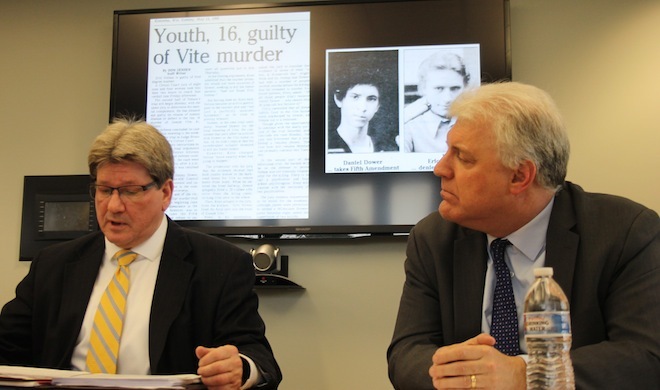 The county officials are urging the community to support the Vite family after they learned a man convicted of killing Joseph Vite, 41, in 1985 could be released from prison by the state Parole Board in May (Jason Arndt/The Report). In 1985, when Eric S. Nelson was 16 years old, he and Danny Dower were convicted in the shooting death of Dower’s foster father Joseph Vite in Bristol. Dower and Nelson are each serving life sentences, but Nelson could be released on parole as early as May. The potential release, according to Kenosha County officials, comes after the state Department of Corrections transferred Nelson to a minimum-security prison in Oneida near Green Bay. Nelson, who received a life sentence plus five years, was eligible for parole after 14 years under a former state statue. Since then, however, the state passed the “Life Means Life Act” in 1988 and calls for a mandatory life sentence without parole. Nelson, in 1999, began unsuccessful attempts for parole. Meanwhile, for Ed Vite, Joseph’s brother, the homicide still haunts him and his family. “This crime has affected our family since the night it happened 35 years ago,” he said at a news conference Monday. In late February, Vite said he received a phone call from the Department of Corrections, asking him for input on moving Nelson to a minimum-security prison. The call, he said, was something he did not expect. Joseph Vite, 41, a well-known insurance agent, was ambushed by Nelson and Dower when he came home from work on Jan. 16, 1985. Dower and Nelson each shot Joseph Vite, but investigators said Nelson fired the fatal bullet, using a larger caliber rifle belonging to the victim. The two then stole Joseph Vite’s vehicle, four deer hunting rifles, a shotgun along with pellet gun and fled to Missouri, where authorities captured them near St. Louis. 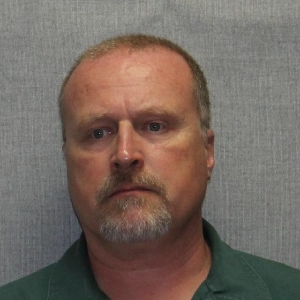 Before the homicide, Dower reportedly told his Central High School, Paddock Lake, classmates, including Nelson, he wanted to kill Joseph Vite because his foster father was always on his case. Nelson, according to testimony from his younger sister at trial, was overheard telling Dower during a phone conversation to make sure a hatchet was in the house when the murder would occur. Following their convictions, Kenosha County Circuit Court Judge Bruce Schroeder called the homicide “an assassination” and sentenced both of them to maximum terms under state law at the time. With the potential release, Kenosha County Executive Jim Kreuser expressed concern for public safety at Monday’s news conference. “I am very concerned that Eric Nelson will reoffend if he is let out. My priority as county executive is to keep the residents of Kenosha County as safe and secure as possible,” he said. District Attorney Michael Graveley said people should be aware that Nelson had a previous run in with the law. “What I would say to someone who says that he was 16 at the time of the killing is how rare it is in human character to be capable of this heinous act,” he said. Nelson, 50, still could pose a threat to the community, he added. “The release of Eric Nelson, now in his early 50’s, is certainly still an individual who would be a threat in this community,” he said. County officials have encouraged community members to lend their voices to the cause by signing a petition supporting the Vite family in its mission to keep Nelson behind bars. “We are encouraging people to sign that petition that will go to the parole commission,” Kreuser said. County officials are also seeking support from Outagamie and Brown County, where Nelson could be released, if parole is granted. “I am sending a letter to a mass list of elected officials in Kenosha County, Outagamie County and Brown County, urging their support as well,” Kreuser said.